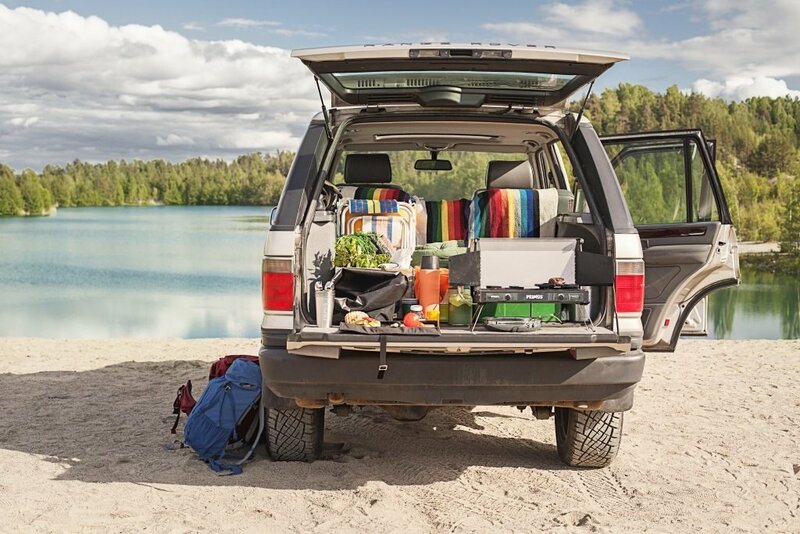 Trash, firewood, fluids, muddy boots, and dirty gear are things we don’t want rolling around inside our vehicles on a camping trip, yet often times there just isn’t a better place to store them. 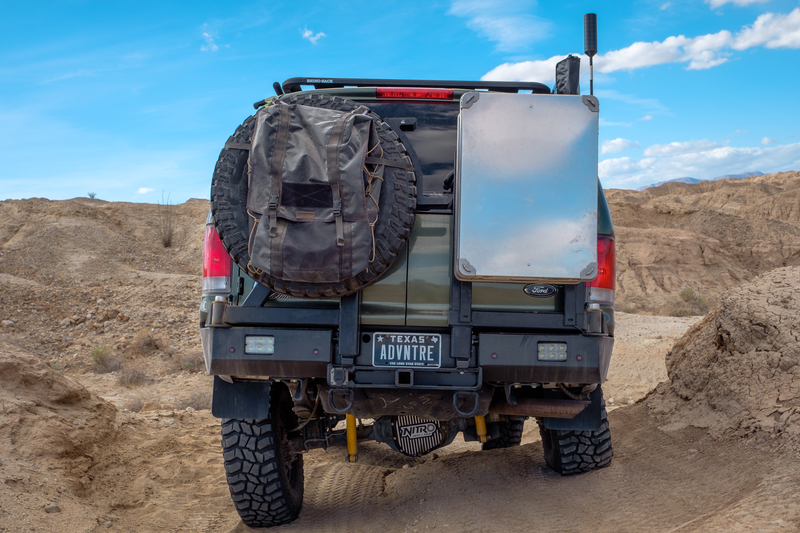 That’s why Blue Ridge Overland Gear created the XL Tire Bag for the back of your truck or SUV. 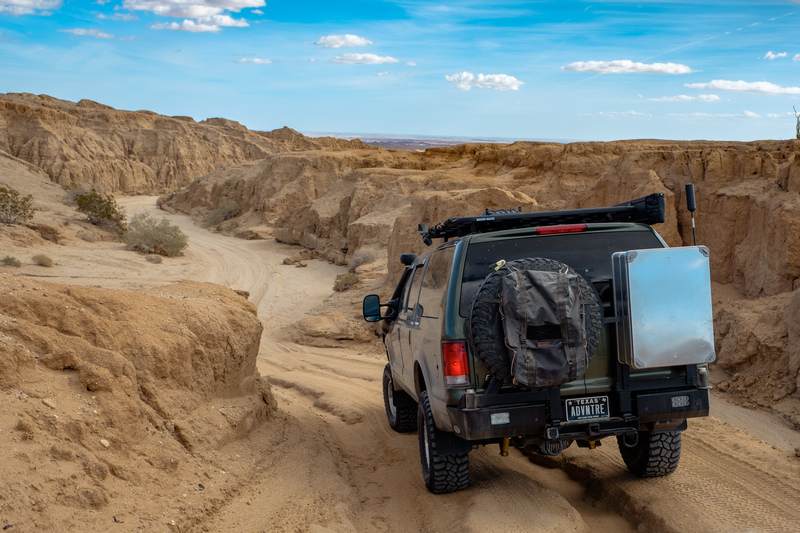 It’s made from a vinyl-coated polyester truck tarp, and uses two mil-spec MOLLE webbing straps to support the weight of the bag and anything you load into it. Mesh exterior pockets are perfect for small bits and bobs, and a paracord draw string allows you to tighten the bag down around the contents to prevent flapping. 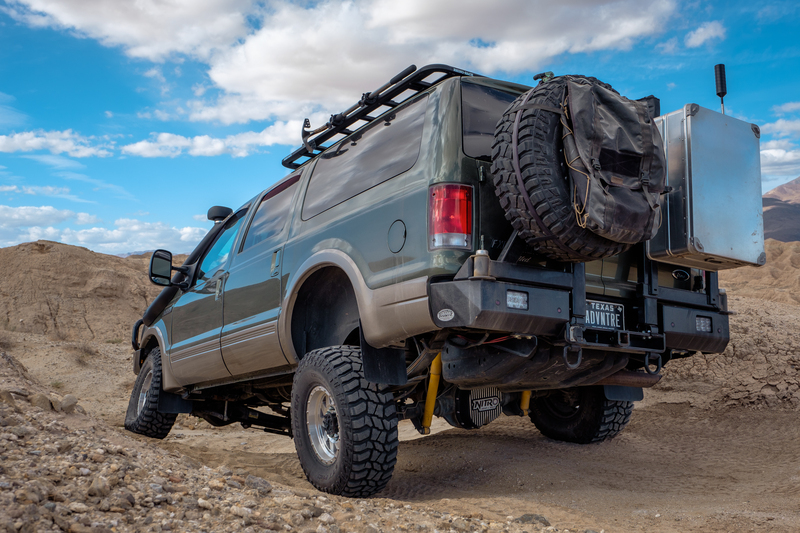 Tires of up to 35 inches can be accommodated with their standard straps, but anything larger would require something custom. The first thing I noticed about the Blue Ridge bag was the quality. It’s made here in the USA with exceptional materials, so nothing feels cheap or fragile like on other tire bags I’ve used. The buckles are stout, the straps are strong, and the carabiner clips will withstand a lifetime of use. Even the vinyl feels durable enough to leave out on the truck full time, which is why I do exactly that. I also love how well this bag stays put on the tire instead of slouching down like a moody teenager’s backpack. We’ve all seen the tire bags that do just that. The capacity is fantastic, the colors aren’t obnoxious, and despite months of life in the desert I have yet to detect any color fading. Oh, and did I mention that the vinyl skin doesn’t absorb water and trash juice? Yeah, that’s a huge win. The biggest complaint I have is that the installation isn’t very intuitive, but Blue Ridge has put out a Youtube video which is a huge help. Don’t be surprised if it takes you a few minutes though. Other than that, I really have no complaints. It is a fantastic product which functionally works exactly how it should. Of course, I will always feel that having a backpack for your truck is a little funny, but I just can’t deny how darn useful they are. If you need a way to haul trash, tote around dirty gear, or send your truck off to its first day of school, the Blue Ridge XL Tire Bag is the best option we’ve tested. The Blue Ridge XL Tire Bag retails for $170. To learn more, visit their website here. Most people’s billfolds today look more like filing cabinets than wallets. They’re chock full of junk from any number of restaurants, gyms, stores, and organizations, making them bulky, cumbersome, and bad for your posture if you’re foolish enough to sit on them. 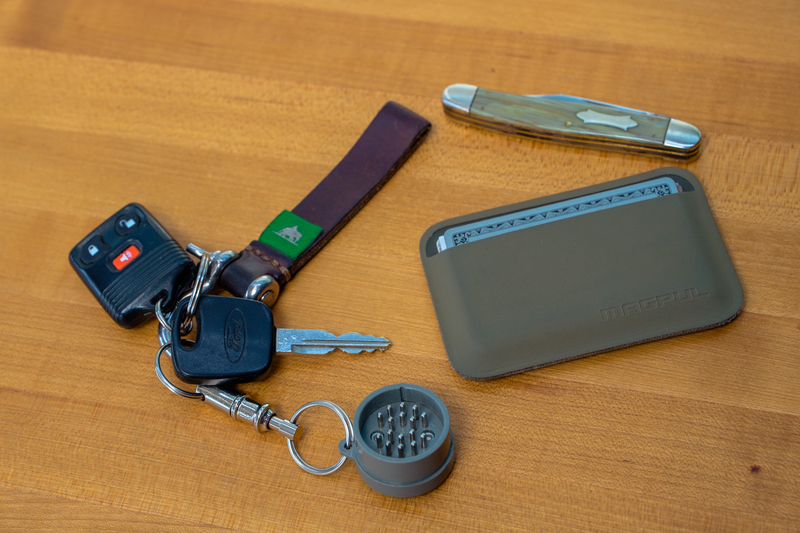 Basically, they’re annoying to carry around, so if you’re looking to lighten up your pockets and slim down those pant legs, take a look at Magpul’s DAKA Essential Wallet. It’s designed to carry the bare necessities of cards and IDs for everyday life and nothing more. To be precise, three ID or access cards, three credit cards, and three bills. It’s made from a reinforced polymer fabric with anti-slip texture, and measures 4.13 x 2.75 inches. More importantly, it’s only 3 millimeters thick! Most of the things we love about this wallet are obvious. It’s comfortable to carry, has a clean and simple aesthetic, and is made from durable materials that will withstand plenty of abuse. At $17, it’s also seriously affordable, and there are several colors to suit your taste and style. What we like most about it though is that it’s a perfect solution for those looking to slim down their wallets but can never seem to do so. It forces the carrier to leave behind the junk that accumulates over time because there simply isn’t room for it. In a world where we are constantly being told we need more, it’s a small way to carry less. Not suitable for cash (beyond a $20 bill or two). If you want a cheap wallet that looks great, is easy to use, and will reduce the clutter occupying your pockets, then you could do a whole lot worse than the DAKA essentials from Magpul. 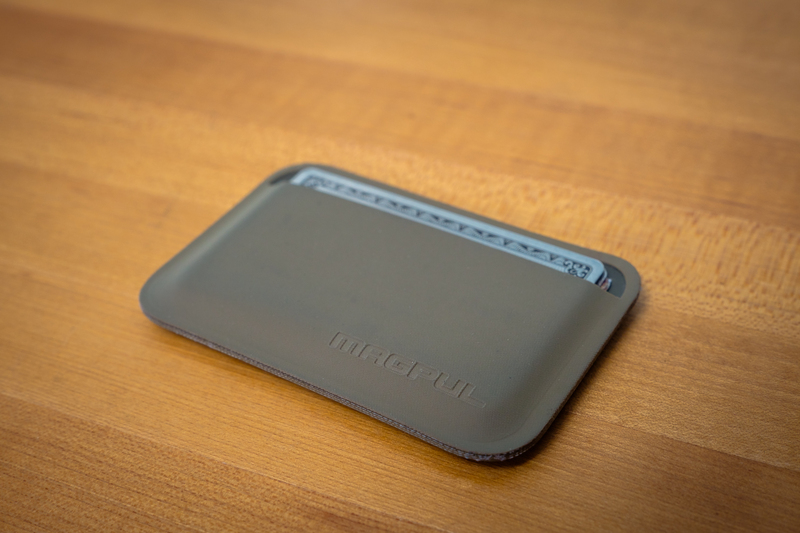 The Essentials Wallet retails for $17, and can be seen on the Magpul website here. A friend of mine once said that overlanding is just driving to remote locations to cook great food. At the time I laughed, but thinking back on it he had a point. For many people, cooking is as integral to a camping experience as sitting around a fire or looking at the stars. It allows them to experiment with local ingredients, share meals with new people, or just relax and eat well with friends and family. Whatever reason lays behind it, having the right equipment can make the task infinitely more enjoyable, which is why I love the Tupike from Primus. Let me start by saying you don’t need this stove to cook camp food. Your old trusty and rusty model will still get the job done, and anyone who tells you otherwise is probably trying to sell you something. That being said, you’ll definitely WANT this stove. The difference in the Tupike is in the enjoyment of the process, and the precision of cooking your favorite dish. It’s in the quality and the craftsmanship, and those factors are apparent from the moment you pick this stove up. The body is formed from stainless steel, and the top features oak laths and a matching handle that locks the lid down tight for transport. 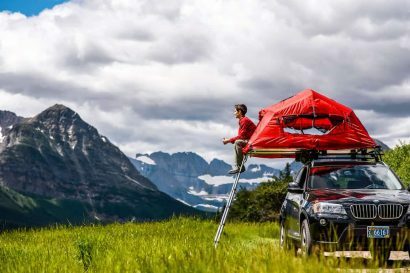 The legs are coated in rubber for a quiet and sturdy base, and the windscreens are held to the internal lid with magnets to keep them from rattling around while on the trail. Then there are the two 7,000 BTU burners, which always ignite with the single click of a button thanks to the Piezo ignition system. Fuel control is precise, and the heat is consistent allowing you to cook at the exact temperatures you want for boiling, searing, and simmering dishes to perfection. 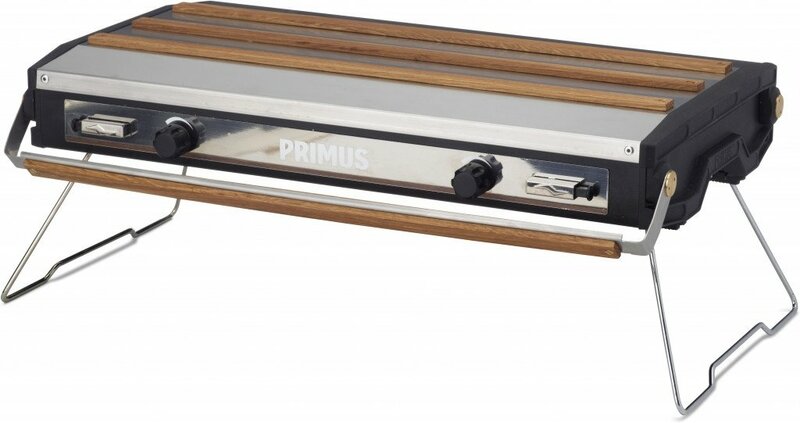 A custom die-cast aluminum griddle plate is included with a branded storage bag, which has been invaluable for tasks ranging from toasting sandwiches to making pancakes for five. Cleanup is a breeze thanks to removable grids and drip tray, and the stainless surface is surprisingly easy to keep clean. In a world where everything is disposable and most people default to the cheapest option, I’m thankful that products like the Tupike exist. 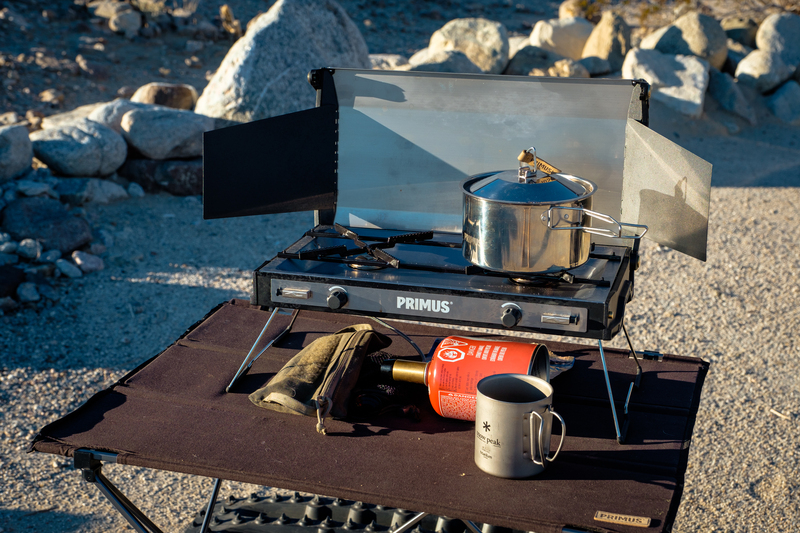 Every inch of this stove is built to last, while providing an exceptional camp cooking experience for its owner. After a year of use, I still get excited each time I click the burner on, and I don’t see that feeling fading anytime soon. 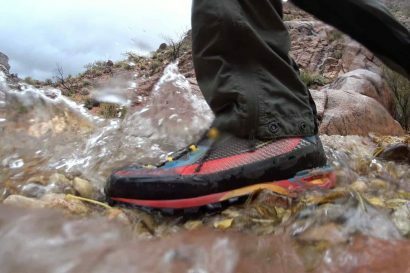 The Tupike retails for $229, and you can learn more about it on the Primus website here. Who doesn’t love a good wool blanket? They’re great for sitting around a fire, having a picnic, or cuddling with your partner on a cold day. 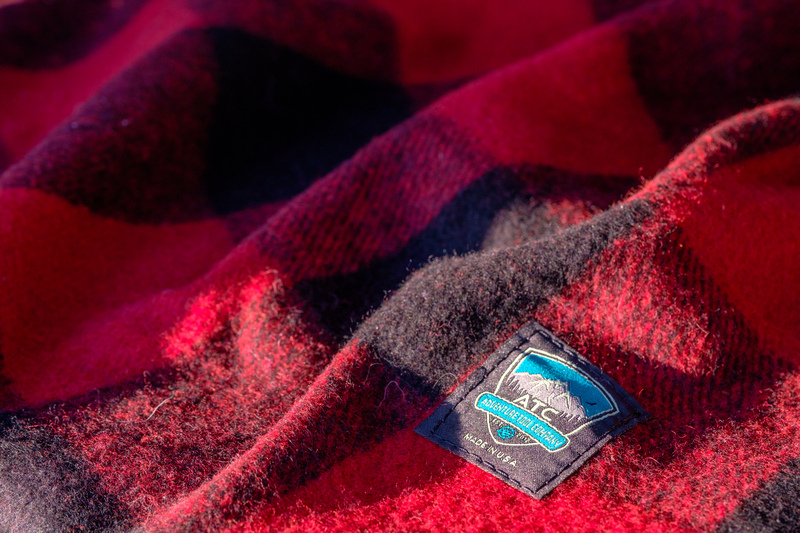 Unfortunately, most are quite expensive, and also quite itchy, but Adventure Tool Company has solved both of those issues with their ATC blanket seen here. This blanket is made from a 50 percent wool and 50 percent synthetic blend which gives it a soft and comfortable feel. It also makes it machine washable, all while retaining the durability and insulating properties of wool. Available in classic gray, green and blue, or red and black plaid there’s a style to fit everyone’s taste and decor. Measurements come in at 6.75 feet by 5 feet, which is a perfect size for camp use or keeping around the house for watching movies or sitting by the fire place. 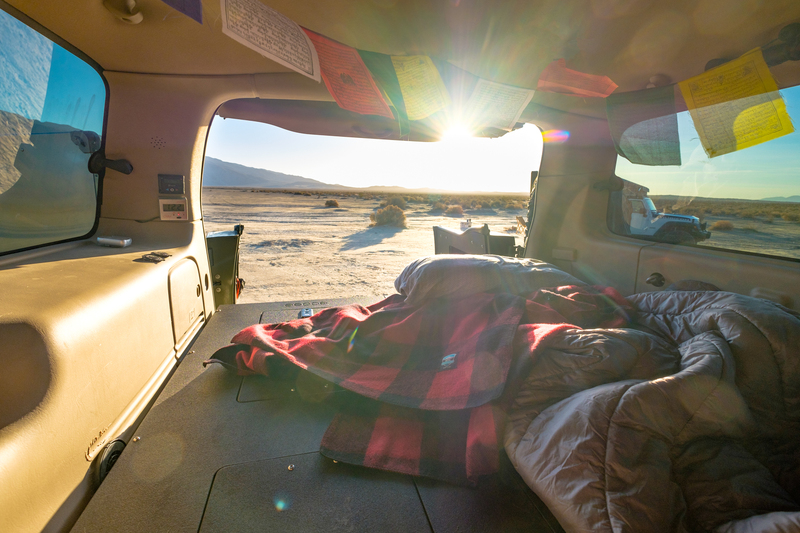 Each blanket is loom-woven right here in the USA and sold by a small Colorado business run by a fantastic couple who are passionate about overlanding, so you can feel good about where your money is going. Not that you’ll be spending that much of it, as each blanket only costs $50. I can’t find a single thing wrong with this blanket. It is simply wonderful. 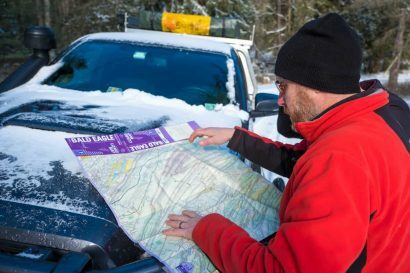 If you’re looking for a warm and attractive blanket that is easy to care for, durable enough for camp use, and won’t cost you an arm and a leg, the ATC blanket is going to be hard to beat. It retails for $50, and you can learn more about it on their website here. Does the wallet have RFID protection?